For the second year in a row, Labor First has been named one of the best places to work in the Philadelphia region. The Philadelphia Business Journal released its list, “Philadelphia Business Journal’s Best Places to Work 2017,” in their Labor First is one of 75 companies on the list. The list includes companies of all sizes in Southeastern PA and Southern NJ. Labor First was named to the list’s “small” category (10-49 employees). 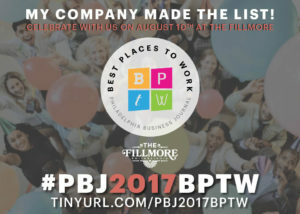 “Best Places to Work 2017” was compiled based on survey input from employees at each nominated company. Interested in working for a company with a great work culture? Labor First is currently hiring Retiree Advocates. Please contact us to learn more about joining our team in Mount Laurel NJ.